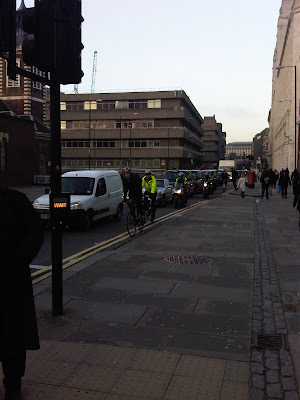 Cyclists in the City: Blackfriars and TfL. Why is there no formal response yet and is TfL meeting is obligations to all forms of traffic on this scheme? Blackfriars and TfL. Why is there no formal response yet and is TfL meeting is obligations to all forms of traffic on this scheme? Queen Victoria Street - Network management. just have to squeeze in and make do? Many thanks for your various responses to my email about Blackfriars Bridge and the northern junction design. I wanted to ask whether TfL has given any formal detail on its intention to extend the consultation period on this scheme. I haven't heard anything specific on this matter only TfL's vague intentions so far. I know of no-one else having a formal response from TfL either. I also wanted to let you know about two further things: a) TfL seems to be embarking on an internal witch hunt about the criticism b) I think there is a deep flaw in TfL’s intepretation of the Traffic Management Act in the context of this junction and many other London schemes. I have heard informally this week from a number of people who work for various London public bodies and have been involved with the Blackfriars scheme. I do not want to mention the individuals concerned as the nature of what they are saying is slightly sensitive. They are suggesting that TfL is conducting several levels of inquiry. It doesn’t seem that TfL is inquiring about the actual nature of the scheme or focusing on any criticisms of the scheme at all. However, people are suggesting that TfL is looking to pinpoint who or which authorities are responsible for the scheme being criticised. I find that scandalous as TfL's first responsibility should surely be to engage with and listen to its client base, ie the people who use the bridge and who have complained to TfL, and should not be to set out on what in my opinion feels like a political blame game. I was surprised by the one response from TfL that was forwarded by some of you and written by Andrew Miles, Government Relationship Manager dated 28 February 2011 in which he stated: "Reducing the number of lanes on the bridge would greatly restrict traffic movement and lead to significant queuing, potentially over a wide area". One person close to the scheme told me (I paraphrase) that: "the scheme has to fit the [traffic] models and cycling has drawn the short straw in the model. What I am beginning to feel is that TfL's interpretation of this obligation means that it regards 'traffic' exclusively as motorised traffic. How else would it be possible, for example, for Mr Miles to publicly assert that the models show significant queuing over a wide area and refer to that only in the context of vehicles? Bicycles are vehicles and they tend not to have to queue as they don't take up very much space. And pedestrians are not vehicles and yet, as I understand, the Act specifically states that "'traffic' includes pedestrians", ie TfL has an obligation to look at this scheme and all TLRN schemes in the context of ensuring a safe and smooth-flowing network for people whether they are on foot, on a bicycle or in a motor vehicle. Mr Miles response, by contrast, implies that TfL understands its obligations are to avoid traffic queues, something which is of no relevance to the other traffic types that have equal right to smooth and safe movement through its junctions. "Where the volume of cyclists exceeds approximately 20% of the traffic volume on any one approach they may have a disproportional effect on modelling results and their influence may need further attention. For this reason it is encouraged to ensure classified traffic surveys explicitly include cyclists." This is one such approach. Cyclists make up 36% of the northbound traffic volume through this junction during the morning peak from 7-10am, according to TfL Surface Transport data. And yet in Andrew Miles's response, there is no mention of TfL having considered the effect of cycling on this scheme. In fact, almost the only mention of cycling has been to express how there isn't sufficient room for both cyclists and pedestrians. Rather than pitting cyclists and pedestrians against each other and making us fight over the space left behind after two new lanes have been added for ‘traffic’, I would suggest TfL needs to go back to the spirit of its network management obligations, to give due regard pedestrians and bicycles as part of network, and to build schemes that nurture and protect those vulnerable road users. Because providing an optimal network for those vulnerable road users is surely just as much a part of TfL's network obligations in the spirit of the Traffic Management Act as securing "a neutral effect on vehicle flow [by which it is clear that TfL is thinking solely about motor vehicles] across the bridge". Nicely put indeed. What is the point in only modelling for the minority, that is to say, those in their cars? Purely from a point of view of equality, cyclists deserve better treatment on the bridge and this junction. And why are they being so quiet about it, anyway? Isn't TfL supposed to be a publicly accountable body steered by the Mayor, an elected official? This has been rumbling on for weeks now and there's barely been a peep from them, though clearly there is lots going on behind closed doors. TfL should speak up and let us all know where we all stand. 10. Section 31 of the Act specifically states that the term “traffic” includes pedestrians. So the duty requires the LTA to consider the movement of all road users: pedestrians and cyclists, as well as motorised vehicles – whether engaged in the transport of people or goods. 12. The overall aim of the “expeditious movement of traffic” implies a network that is working efficiently without unnecessary delay to those travelling on it. But the duty is also qualified in terms of practicability and other responsibilities of the authority. This means that the duty is placed alongside all the other things that an authority has to consider, and it does not take precedence. So, for example, securing the expeditious movement of vehicles should not be at the expense of an authority’s road safety objectives. But, the statutory duty reflects the importance placed on making best use of existing road space for the benefit of all road users. 36. Safety and environmental considerations remain important as does the operation, maintenance, repair and provision of services. The duty takes account of this. For example, measures to secure the expeditious movement of traffic should always be safe for all road users, particularly pedestrians, cyclists and motorcyclists. Clearly in meeting their duty LTAs also need to consider their other responsibilities such as those under environmental protection legislation, the Disability Discrimination Act, Health and Safety and planning legislation. If only TFL actually cared about pedestrians and cyclists. They don't, clearly. Bozza has been deponing again today about his measures to tackle congestion. (http://london.gov.uk/media/press_releases_mayoral/mayor-hails-measures-tackle-congestion) Funny how neither he nor his grand vizier of transport, Kulveer Ranger, saw fit to mention cycling - that came from, of all people, the *Automobile Association*!